Dating the boy accused of trying to kill you is complicated. Proving he’s innocent is downright deadly. Seventeen-year-old Lydia’s life is jolted when she’s nearly killed in a drive-by shooting. Things take another crazy turn when she meets Nathan, a hottie with a killer smile—and a delinquent past. Romance ignites between Nathan and Lydia, but crime overtakes their small town and evidence points to Nathan’s involvement. And when he’s accused of firing the bullet that almost killed her in the drive-by shooting, Lydia’s convinced he’s being framed. But why? And by whom? Lydia sets out to investigate, but as she creeps closer to uncovering local secrets, someone lurks on the sidelines, ready to silence her. With her life and Nathan’s freedom on the line, she must expose the truth behind the crimes, even if it means breaking the law herself. Review: I don't normally pick up a contemporary romance, its not really my thing, but this one was written by my fellow Evernight Teen Author Rachel Rust, so I decided to give it a read. At first, I was like, this is a lot of teenage touchy feely stuff, and then I just got sucked in by the characters and I wanted to punch something. This poor guy names Nathan keeps getting blamed by all the people in the town for everything bad that's happening. Rachel really brought the worst out in people which made me really hate them. I mean, come one. Toward the middle of the book, I was certain that I had it all figured out who was doing all these bad things. It was so obvious... Um, yeah. I got that wrong. Turns out it was the last person I thought. I really enjoyed the way this book ended and how the main characters never lost sight of what was important, each other. The only gripe I have with this read is the part where Lydia puts on her pointe shoes and likes the way the wood feels on her feet. Being a ballerina for 14 years myself, I've never heard of a pointe shoe being made out of wood. I even did some research, just so I didn't put my foot in my mouth, just in case I didn't know everything. The box of the shoe is actually made out of cloth, paper and glue. This gives them pliability when the dancer is standing on them. But that is neither here nor there. I would recommend this read to anyone who loves a good teen romance. 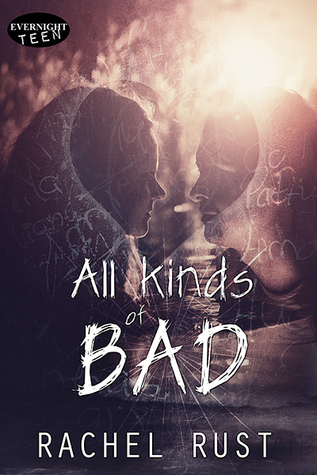 Four stars for All Kinds of Bad.